Making music and living far from the capital city of Indonesia does not make Wake Up Iris !, a duo from Malang, East Java, missed the opportunity to represent Indonesia on the international music scene. The reason is, after becoming one of the Go Ahead Challenge 2017 winners and getting the chance to become a participant and performed at SXSW 2018, Texas, USA in March this year, they will again represent Indonesia at Zandari Festa Music Conference and Festival 2018, Seoul, South Korea on the next October. Not only Wake Up Iris !, this year Indonesia will also be represented by Kimokal and Lightcraft from Jakarta. Three of them will enliven Zandari Festa on October 4th – 7th 2018. Previously, electronic duo from Bandung, Bottle Smoker became the representative of Indonesia at Zandari Festa 2017. Zandari Festa is the largest Showcase Festival and Music Conference in Asia that became a reference for promoters, music festival organizers, music distributors and independent musicians in Asia and all around the world. Starting in 2012, Zandari Festa has presented hundreds of musicians from all over the world with varied genres over the past 6 years. As usual, this year Zandari Festa will be attended by organizers of major Music Festivals from around the world such as Glastonbury (UK), Great Escape (UK), Clockenflap (HK), Big Mountain (TH), and many more. Zandari Festa has also partnered with Sound City Festival in Liverpool since 2016. Held in Hongdae, the epicentre of Korean independent music scene and young people in Seoul this year Zandari presents over than hundred musicians from 18 countries such as Britain, Japan, France, Indonesia, Hungary, Canada and others . Not only as the line ups, participants could also attend international conferences and build a wider network through this event. The re-involvement of Indonesia in this festival is a very good sign for Indonesian musicians. “This can be a proof that there are so many Indonesian musicians that can be accepted internationally” said Bie Paksi. This time, supported by Siasat Partikelir in Siasat Trafficking program, Wake Up Iris! will enliven the festival showcase and use the moment to bring their first album around South Korea and Malaysia with a tour titled AUREOLE Asian Tour. 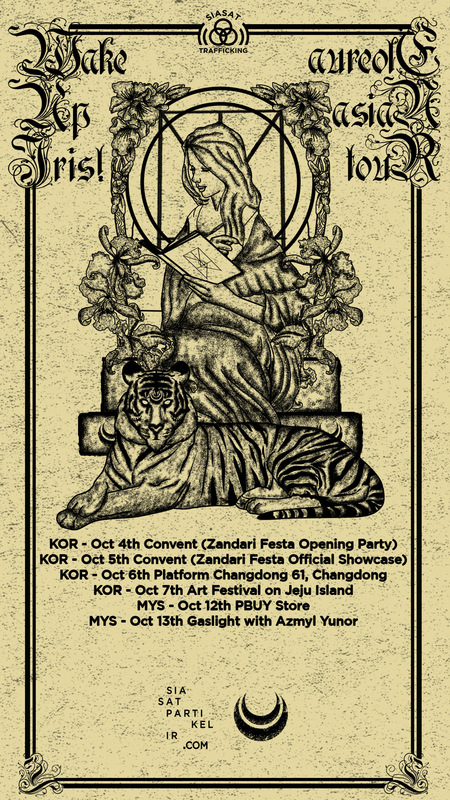 Starting with being one of Zandari Festa’s line-up opening parties on the first day, performing at Convent on October 5th , playing in the Changdong area exactly Platform Changdong 61 on October 6th and flying to Jeju Island on October 7th to play at an Art Festival there. Coming home from Zandari Festa, Wake Up Iris! will perform in Ipoh and Kuala Lumpur with Malaysian soloist Azmyl Yunor at Gaslight “We want to get to know more people through music and want to spread the positive vibe of our music as far as we can,” explained Vania Marisca. After much teasing, eventually the debut album for folk band hailing from Malang, Wake Up Iris! is finally out. Titled “A U R E O L E”, the album is revealed on digital platforms on 24 January 2018, before they are sent to the shelves on your favorite record stores. Bie Paksi and Vania Marisca of Wake Up Iris! created this album after finishing their Prelude showcase tour across Jakarta and Bandung in 2017. Beforehand, the duo have also revealed the live forest session of single “Rain’s Tale” in the beginning of 2017 and another single called “Metanoia” on Spotify in April 2017. The debut album was released in conjunction with their three year mark after they first set foot on stage. So many things have happened to this musical project in those period, making this album a fruit of their hard labor. The debut album aims to introduce the band in a more comprehensive way than previous releases, making their brand and unique musical quality more known to the public. This album’s philosophy is like traveling both physically and mentally. It talks about the high spirit to spread kindness from within, anger towards volatile humanity, and longing to travel and find homes in between journey. For short, this album is the first stepping stone towards more greatness we’ll be able to witness from Wake Up Iris! in the future. They got the inspiration for this album from nature, especially when they traveled across mountains at Gowa, Makassar last year. They try to provide the perfect sound design for their music character in Indonesia’s ever-changing music industry. The artworks which tell about microcosmic and macro-cosmic were created by Kongsi Rupa Macan Unggulan, a design studio situated in Malang to better convey the message that the band wrap within this album. The band are ready to take their violin, kick drum, and guitar on the road with a planned tour starting in April – May. Several cities across Indonesia have been included on their list, although they haven’t spilled all the details. Welcome to Wake Up Iris! universe with “A U R E O L E” which will be available on Spotify and iTunes soon. Get more details about the album here and pre-order the CD as well. kota Malang, Bejo Sandy dan videografer Varian Tyan. bertemu dan melihat sosok Bejo sebagai seseorang yang mewakili pesan yang ingin kami sampaikan. Sudah lama ingin menggarap kolaborasi ini, syukurlah sekarang telah kesampaian.” Tambah Bie Paksi. pendidikan kesenian teater dan musik karinding di sekolah-sekolah hingga perguruan tinggi. industri musik oleh para ahli. Setelah merilis album pertama mereka, A U R E O L E, pada tanggal 24 Januari 2018, Wake Up Iris ! akan segera bertandang ke beberapa tempat, sebelum akhirnya mengikuti serangkaian acara di USA bersama program kreatif Siasat Pertikelir dan para pemenang Go Ahead Challenge 2017 lainnya di bulan Maret 2018. Rangkaian tur akan dimulai di Jogjakarta pada tanggal 20 Februari 2018 di Ruang Gulma dan dilanjutkan ke Semarang keesokan harinya di Impala Space, Spiegel Building. Lalu Wake Up Iris ! akan menuju ke Bekasi tepatnya di Kedubes Bekasi pada tanggal 28 Februari dan menutup perjalanan mereka ke Pamulang, di EARHouse pada tanggal 1 Maret 2018. Mereka juga akan mengadakan Radio Tour seperti Ruru Radio dan Soundquarium di Jakarta Selatan. Album pertama Wake Up Iris !, A U R E O L E ini memiliki tema besar melihat makrokosmos melalui mikrokosmos, manusia itu sendiri. Pengerjaan album ini sudah dimulai sejak April 2017 setelah Tur Showcase mereka ke Jakarta dan Bandung. Berisikan 7 buah lagu original, Wake Up Iris ! ingin menebarkan pesan pesan yang mereka dengar dari semesta dan disampaikan melalui lagu lagu mereka untuk memberikan semangat positif, mengajak pendengarnya menjadi pelangi di bumi ini dan memulai kebaikan dari diri sendiri. Single yang akan diusung oleh Wake Up Iris! adalah Nefelibata, sebuah lagu yang menurut mereka mewakili semangat dari album pertama mereka. Single ini akan segera rilis bersama Video Lirik sebelum dimulainya tur bagian pertama ini. Dalam Video Lirik ini Wake Up Iris ! bekerja sama dengan Videografer Varian Tyan dan seorang seniman teater, Bejo Sandy. Wake Up Iris ! adalah Bie Paksi dan Vania Marisca. Mereka memulai projek musik ini sejak tahun 2015 dan telah merilis satu album dan satu Live Forest Session berjudul Rain’s Tale. Wake Up Iris! juga pernah menjadi line up di berbagai acara seperti Folk Music Festival, Malang 2015, Soundrenaline, Bali 2017, dan Musik Hutan, Makassar 2017.